This baked pasta tart with smoked tofu and mushrooms is a budget-friendly vegetarian recipe you can make for dinner, lunch or even picnics and potlucks! Add water in a large pot. Add ½ Tbsp salt. Add pasta and sliced mushrooms. Boil for 10 minutes. Drain pasta and mushrooms and move them into a large bowl. Add all the other ingredients, except cherry tomatoes and zucchini slices. Mix well. Use a cake tin with detachable walls/round yena bowl or simply just a pot. Cover it with parchment paper and grease it. Cover the bottom with zucchini slices. Add the composition from the bowl and spread it evenly. 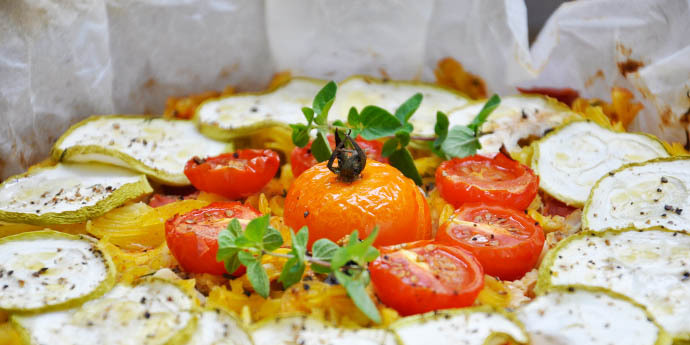 Put some zucchini slices on top and garnish with cherry tomatoes. Bake at 200C/392F for 30 minutes.